My brother used to have a G.I. Joe as a kid. 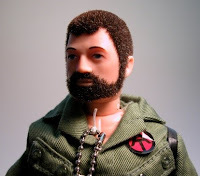 I had a Barbie. She changed clothes a whole lot but I’m not sure what Barbie DID. Joe, on the other hand, was a man of action. TV commercials about Joe always showed him pursuing really exciting activities like driving the jeep over rocks or parachuting in to save the day. You just knew Joe was rough and tumble and wouldn’t hesitate to jump in to help the other toys. Dene Dawson reminds me of G.I Joe (and not just because he favors khaki and cargo pants). Dene enters the room like a whirlwind - usually doing three things at once. He juggles the tasks and commitments of his life with the dexterity of a circus performer and keeps a positive attitude throughout. Dene is a man of action, and like Joe, won’t hesitate to jump in and help. A few years ago while visiting Sweden we experienced multiple food servers who seemed angry to be in a position of service. This contrasted greatly with our time in Japan where service is truly an art. Perhaps the two cultures have very different ideas of what service is... It appears that in Sweden service has an underlying concept of one person having lower status than the other - so service provides an outward and visible sign of inequality. Since Sweden is VERY concerned with fairness this perceived inequality might cause emotional dissonance within the server. In Japan the concept of service is more akin to “help”. A diner in Mos Burger will receive the same attentive care from staff as a diner in a Michelin-starred establishment. In Japan, the individual builds an underlying sense of accomplishment with each instance of helping another person. So Japanese take pride in serving to their utmost ability. Over time Habitat Cabarrus grew in size and scope and Dene’s responsibilities morphed as well. 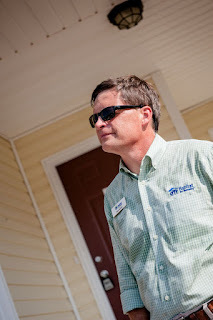 Six years later, Dene is the Program Manager, which places him in charge of construction management, land development, urgent repairs, and maintaining Habitat’s transitional housing facility. In addition, Dene builds relationships - relationships in the municipalities Habitat works within, relationships with the subcontractors and vendors who perform work for Habitat Cabarrus, and relationships with the families served. Dene has accepted a position with a national builder that provides him with new professional challenges and will join their organization in September 2016. We will miss you Dene. Drive your SUV over new rocks and help build something strong. 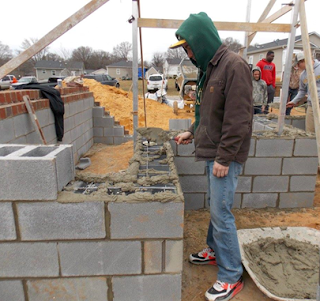 Each year, masonry students from Jay M. Robinson and Central Cabarrus High Schools come together to lay the foundations for Habitat homes in Cabarrus County. Since partnering with Habitat in 2009, students at these schools have been able to take what they learned in the classroom and experience it first-hand on a Habitat build site. “The students experience teamwork, build pride, build friendships with another school, and on-the-job training,” says Darren Hartsell, Masonry Teacher at Jay M. Robinson High School. Each foundation gives our volunteers and partner families the starting point they need to build each home. 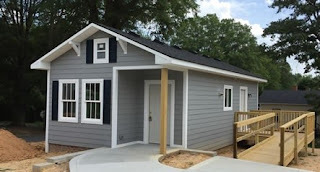 When the home is complete, it provides a Cabarrus County family with the strength and stability they need to build a better life. Thank you to Cabarrus County Schools for their partnership with Habitat Cabarrus. 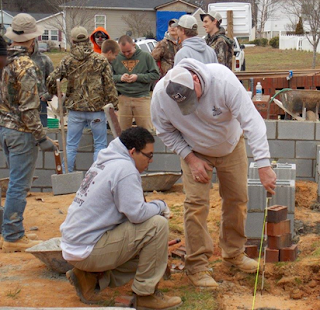 We look forward to working with the masonry students from both schools again this year. Masonry Teacher Darren Hartsell created a video that shows the progress of laying the foundation for a Habitat home. Click here to watch it.